Discovering, tasting, sharing… Our cellar is the privileged place to meet. It is open all the year except Sundays and public French holidays. Except the wine tasting in shop, other visits will be considered on an appointment basis (Group, cellar, vineyard). The Mazet reflects magnificently our sense of hospitality. It is a perfect place for relaxing in the region. 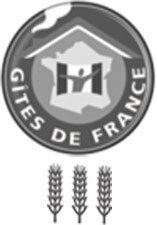 Graded 3 "epis" by the Gite de France, it provide an idyllic holiday surroundings. Garden Under cicadas, private pool, pool house, barbecue, shady parking place.